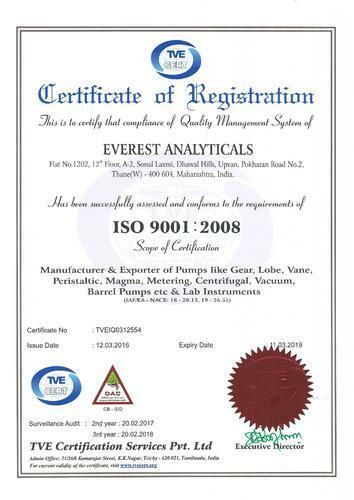 Incorporated in 2005, we, "Everest Analyticals", are pioneers in pumping technology and instrumentation. We are engaged in manufacturing, supplying, distributing and exporting an extensive variety of Rotary Pumps & Laboratory Equipment. We have a vast clientele that is spread across multiple locations. Our products are characterized by cutting edge technology, impeccable designs and long term functionality. We have gained immense appreciation and have successfully established a strong foothold in the industry. We believe in consistent innovation so as to be able to contribute towards technological progress. Our products are utilized in multiple process industries applications. We are driven towards providing maximum satisfaction to our customers. For this purpose, we even create customized offerings which fulfill their requirements in entirety. We export our products to different parts of the world, some of the countries where we export our products are Canada, USA, South Africa, Middle East country, UAE, Philippine, Singapore, Thailand, Indonesia and from European Countries. Our products are highly regarded for their dimensional accuracy and hassle free service, which provides us an edge over the competition. We manufacture them as per a standardized process in order to maintain consistency in their quality. We strive to provide cost effective solutions to our esteemed customers. We have a zealous team of dynamic individuals who have gained immense expertise in their respective areas of functionality. These individuals persevere to update themselves with the latest market and technological developments so as to stay ahead of the race. All these individuals work in perfect harmony with each other to ensure spectacular results. Our strength lies in our values and principles, which have guided us constantly on the path to success. Our manufacturing range consists of Rotary Pumps & Laboratory Equipment. With our commitment to quality and prompt deliveries, we at Everest are fully geared to meet the challenges and demanding applications of process industry. 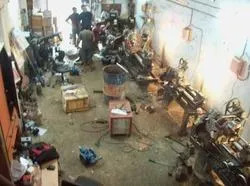 We have established a state of the art infrastructure which enables us to carry out our processes smoothly. 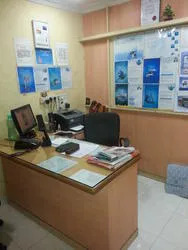 It is equipped with all the essential equipment and amenities that are crucial for hassle free functioning. We aim at providing our personnel the best possible work environment so as to enable them to function in the most efficient manner. All the units in our infrastructure work in close coordination with each other to attain best possible results. Blessed with a highly efficient team of self motivated individuals, we have come a long way in our pursuit of success. We choose our employees with due care so as to ensure that they can blend well with our organizational culture, thus giving their best. These individuals are handpicked for their expertise and positive attitude. We take several steps to ensure that our employees are updated with the latest market developments. We encourage them to achieve their personal goals along with the stated organizational objectives.